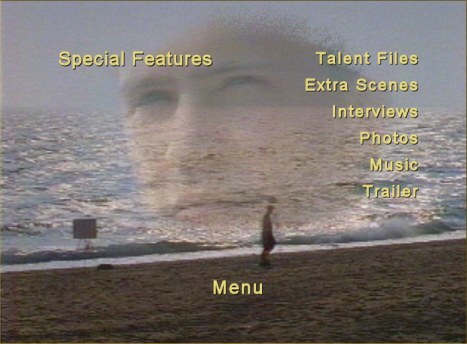 DVD Menus are a mix of video loops and DVD button navigation. There is no limit on what a video loop background for a menu can be.Usually these motion menus are limited to 1 or 2 minutes but in special cases they can go on longer. All types of software motion graphics programs may be used to create the video motion menu, from 3D animation to montage of images like a sports show opening.Once the background is done, it is then brought into a DVD authoring program and the buttons are added in. Menus can be full motion, still or panorama. Full motion menus may be created by many different methods, using motion graphic effects, video editing, 3D graphics or by using footage from the main feature or from stock footage. Still menus are created from any still source or original graphics can be made. Panorama photo menus may be made created by sending a photographer to a location. They usually cannot be made from existing photos. Panorama Computer Graphics are made by Visionary Productions. Panorama motion menus are possible. Please inquire for details. Audio tracks can be stereo or surround sound for all menus. All motion menus can have a first play segment that does not repeat. Motion menus that repeat are usually made to have no pause for the first repeat. Thereafter, the repeat pause is usually about 1 second and depends on the DVD player. PAL and NTSC formats are different and DVD must be authored separately to match the American or European television standards. Similar menus can be used, but each font size, frame rate and overall picture size must change. This will increase the cost of the menu creation. Alternate menu text for different languages require a different set of menus. Video loops of the menus need to be separate. This will increase the cost of the menu creation. First Play (motion menu)Plays once and often merges seamlessly with the Main Menu. Special Features - (motion menu) Often includes links to menus listed below which can be motion or still menus. Usually 35 seconds each. There can be a separate transition going into a menu and coming back from a menu. This can add up easily to 10 or more transitions. All audio types are available. Created automatically with a dissolve or wipe between menus. New original transition motion graphics may be created. New original transition from a photo or stock footage video.